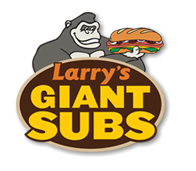 Larry's Giant Subs is the only sub chain out there that focuses on serving healthy and nutritional products. Our Roast Beef is ALL NATURAL, Black Angus USDA choice with no injections. We use Raikes Farms Antibiotic-Free Turkey Breast and Grilled Chicken Breast, which is: Antibiotic Free, Hormone Free & Sustainably Farmed. Our award winning bread comes straight from Costanzo's bakery, right in the heart of Buffalo, NY Serving Breakfast and Delivering by Doorstep delivery. $10K franchise fee.